Lighting your yard adds beauty, property value, and increases safety. We	will work with you to create an ideal outdoor atmosphere. Do you want	to illuminate a particular tree? Light a path or driveway for safety? Do you want colored light to shimmer off the splash of a fountain? Do	you want to light your deck so that you can talk with friends after sundown? Light your yard like fairyland? We will help you make your dreams come	true while increasing the value of your property. We offer a wide variety of the highest-quality weather-sealed fixtures. We will be happy to answer any questions you may have about landscape lighting. 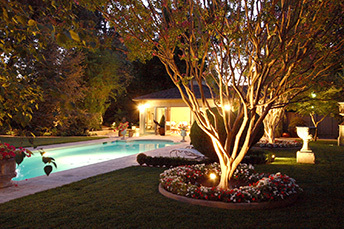 We can help you design lighting for safety, beauty, and the increased	usability of your yard after the sun goes down. We have an electrical service for you. From lighting problems to generator installations. There are many ways to save with us. See some of our latest online discounts. Speak to one of our highly qualified electricians and get the info you need for your next service.